December 1 is Worlds AIDS Awareness Day. 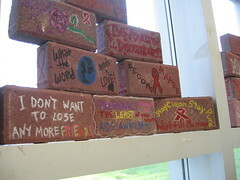 We had a full slate of activities on campus including brick painting. Remembering Mark, Ron and Francis. Supporting all the PWAs I still know and care about. Previous Previous post: Chumby – um, the Audrey kicked up a notch? ?